DD5LP – January 14th. 2015 – DM/BW-078 Römerstein & DM/BW-484 Bussen. I had intended to use my new 40/20/17/15/12/10m linked Inverted-V dipole for these activations, but adjustments over the previous 2-3 weeks (between snow storms and high winds) had proved annoying in that once one problem was solved another came up and the antenna simply wasn’t ‘Idiot-Proof” enough for use on a summit yet. Maybe next time. My 6m squid pole’s base seal has broken, I have repaired it, but to be safe I decided to take the (albeit heavier) 10m DX-Wire mini-mast that I bought at Freidrichshafen in 2014 and along with that as I needed to cover 10 & 15m, the Aerial-51 OCF dipole. I also packed the RHM8B vertical and it’s tripod in the car, just in case access to either summit turned out a lot harder than expected or if there was no where to put up the Inverted-V. This antenna actually stayed in the car and was not needed. Apart from those changes, the planned equipment was the usual Yaesu FT-817ND running off the internally installed 2500maH LIPO battery, with a spare LIPO along just for backup. Although I also packed my small amp and cables, as this only works on 40,30,20m it wasn’t used and stayed packed in the bag. All contacts were made on 5W output with the DF4ZS RF Speech clipper in the microphone boosting the signal a little. Navigation: For my activations unless I know the summit I usually write out a route based on the route google maps produces, but simplified to just the important points. The google printout is too detailed and this makes it unlclear to read when driving alone to a summit. I do have a GPS navigator program in my smart phone but I don’t trust it. It can ask me to go down roads that are not public access and generally doesn’t find the shortest route. I prefer to take the google maps produced list and check it against the map to understand the route. I made three navigation lists. One from home to Römerstein, one from Römerstein to Bussen and the third from Bussen, back home. All are printed in large text so that they are easy to read when driving. The locations were DM/BW-078 Römerstein and DM/BW-484 Bussen. Both of these summits are about 1hr. 40mins drive from my home QTH. As they are in the same general (North West) direction, rather than making two separate trips, I decided to combine the two summits. I also wanted to try to get a second W4V contact to qualify W4V as an association (and also North America as a continent) for my Mountain Hunter Platinum Award. In the meantime, I managed two contacts into the Canary Islands, which gave me Africa as my third continent but I still wanted the NA continent. Eric W4EON again offered to go out to a summit for me to try a S2S contact. It appears the best bands currently for an EU to NA contact is 15 or 10m from about 1400 to 1600 UTC, so the plan was set. 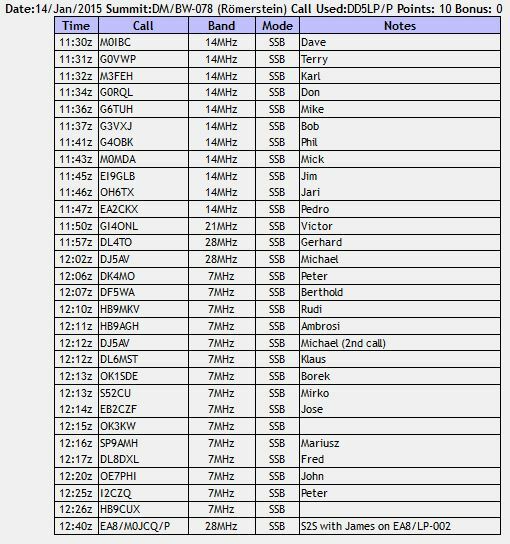 I would call Eric at 14:30 on 15m and then we’d both move to the activation for other chasers by spotting ourselves at 15:00 UTC. As you will read below, the best laid plans don’t always go well…. Römerstein is easy access with just over a 1Km walk from the car park on the main road. Despite several rain storms that I drove through on the way, when I arrived it was not raining. The track from the car park was very muddy from the previous nights rain so some care was needed but I still got up the track OK. At about 700m the track joins the forestry road to take you to the top of the summit with it’s tower, hut and picnicing area. I set up by the open fireplace and was quickly operational. No RF noise and strong signals but when the sun was not out, it got very cold, very quickly. I was glad of my thermo gloves which allowed me to operate and log without any issues. I managed 30 contacts from Römerstein the final one being a summit to summit contact with James M0JCQ on the Canary Islands – La Palma summit EA8/LP-002. Although my abreviated notes got me simply and without any issues to the first summit (Römerstein) I got lost on the way from my first summit to my second. Either I missed a turn or Google got it wrong. In any case I found my self in a village that I didn’t recognise the name of and the road signs to the next towns & villages didn’t ring any bells either. At this point it appears from checking later that I had travelled only about 8Km after missing a turn Without paper maps of the area I set up my Navi (yes it was my fallback). The “navi” eventually appeared to be taking me in some logical direction and indeed I did eventually arrive at Bussen but coming into it from the totally opposite direction than I would expect (i.e. from the South rather than the North where the previous summit was) but the time taken in setting up the GPS (yes it was my fallback), the time to return to where I should have turned off and the extra time the navigator took in asking me twice to do a U-Turn on the same road(! ), plus the fact that it then took me a longer way to the destination probably lost me at least 40 minutes. End result, by the time I had climbed to the summit it was almost 1500 UTC and by the time I had set up it was 1505. Thankfully the climb from the cemetry car park to the summit is short (if rather steep) up a roadway. Almost as soon as I reached the summit, the ice-rain started. As I was now probably too late for my sked with Eric in the US, I decided to activate as quickly as possible to qualify the summit and get back out of the wet and cold into my car. Having problems with the rain on the Smart phone screen meant I couldn’t type easily to put my spots up, which was ultra-annoying! I did manage 10 contacts to qualify the Bussen summit. I will not be driving to summits in the area of these two summits again, without a paper map of the area. The roads are terrible and the road signs worse. Bussen was a difficult activation with the wind and ice-rain and at the time when I decided I would pack up my equipment, the antenna came down on it’s own, tangling the dipole wires in the tree branches, so it took a while to get everything packed up. The drive home in the wind, rain, dark, spray from the road and glare from headlights, was not a pleasant experience either. That’s the trouble with a late afternoon activation some distance from home at this time of year I guess. 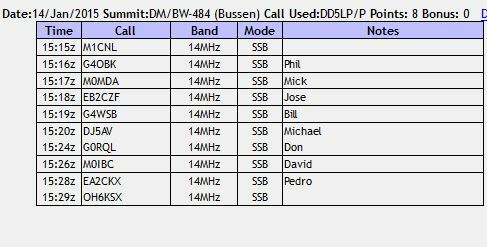 As mentioned above, the reason for the late afternoon activation was that I had arranged a sked for an S2S contact into the US but unfortuantely I missed it by about 15 miutes with all the delays in getting to Bussen. 10 metre DX-Wire Mini-mast squid pole. Do not rely on a route written out from Google Maps and then miss a turn. Do not rely on a GPS Navi to take the shortest / quickest route when GPS reception is affected by stormy weather. Do not do late afternoon activations a relatively long distance from home at this time of year. This entry was posted in SOTA and tagged Bussen, DM/BW-078, DM/BW-484, Römerstein, SOTA by VK2JI DD5LP G8GLM. Bookmark the permalink.